Some people get earworms, songs stuck in their head, and can’t think of any other music because of that tune that won’t go away. I have this issue with recipes instead of music. Is that a recipeworm, foodworm, brainworm? I don’t think I like any of those names for the condition. I’ll keep working on that. This soup was one of those recipes that took up residence in my head and wasn’t going to leave. I saw it in the December issue of Bon Appetit and thought of it every time I saw carrots. It’s an incredibly easy soup to make, but this is one of those times when simple is perfect. You roast chopped carrots and then puree them with vegetable broth, and that’s the soup. But, what makes those carrots especially tasty is the melted butter that’s drizzled over them before they’re roasted. The power of butter to elevate flavor is a marvelous thing. I happened to have a few spring onions that had just arrived from my CSA, so I roasted and pureed them with the carrots which added one more layer of flavor to this simple soup. Then, it’s all about the garnishes. A nice, little dollop of thick yogurt and a sprinkling of dukkah, and this was a recipeworm, for lack of a better name, that was worth having. To make the dukkah, you toast shelled pistachios in a dry skillet and then let them cool on a plate. Next, you toast sesame seeds, coriander seeds, cumin seeds, fennel seeds, and peppercorns in the same skillet. I chopped the pistachios by hand and ground the spices and sesame seeds with a mortar and pestle with some salt before combining them. This spice and nut mixture can be made in advance and stored at room temperature. The carrots were peeled, cut into big chunks, and placed on a baking sheet. I trimmed spring onions, cut them in half and tossed them on the baking sheet with the carrots. Just two tablespoons of butter was melted and drizzled over the vegetables before they were roasted in the oven for about 25 minutes. The roasted vegetables were transferred to the blender and pureed with vegetable broth. The puree was reheated in a large saucepan before being served with thick yogurt and the dukkah. This soup with the toppings is delicious all by itself, and I discovered it’s also a very good soup for dunking grilled cheese sandwiches. I’m glad this stuck in my head until I finally tried it. Now, I need a better name for this condition. Any suggestions? Oh, dukkah is one of my favorite spice blends! This soup is magnificent and sounds extremely tasty. 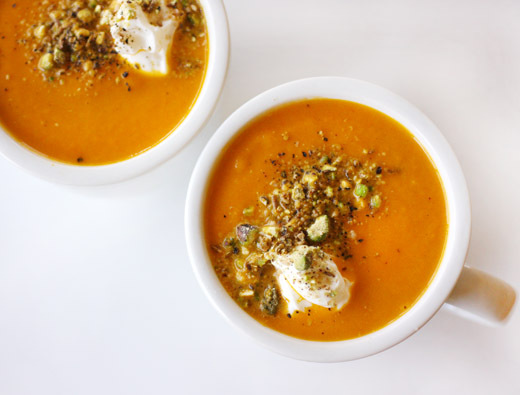 I love carrot soups and Addition of pistachios make it even better. The first time we ever played around with dukkah was when a small bag of the spice mix ended up in our swag bags after the first Foodbuzz conference. Such a great flavor. Love it with the sweet carrots. The dukkah and yoghurt would be lovely accompaniments to this soup. I think this could be called a recipeworm. Maybe you have created a new word. How perfect for the start of our cold weather :) And the dukkah must be an amazing kick in the carrot soup. So nice to hear someone else agree with me....the toppings on soups are almost the best part! Love the name dukkah! Great recipe, Lisa. Roasting results in such delicious veggies. carrots make the loveliest soups! what a great color on this one, and the flavors you've added sound fantastic! 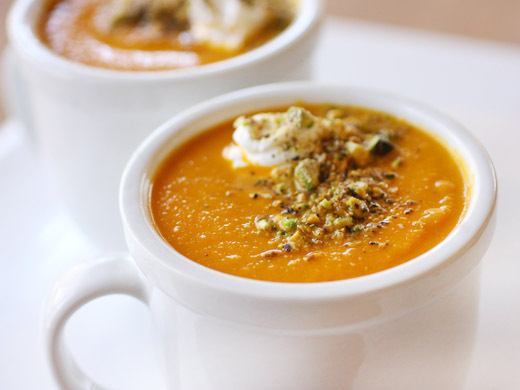 Absolutely delicious soup - butter roasted carrots and toasted pistachios - drool inducing! Lovely presentation too Lisa! I've made a similar soup - it really is good. Haven't made dukkah, though, and I'll bet its flavor absolutely makes the dish. Really excellent stuff - thanks so much. Your soup looks delicious and filling. Early spring/late winter would be the perfect time to serve this beautiful soup - wonderful! butter really is amazing :) this is just lovely, a beautiful spring recipe! The color of this soup is so vibrant! Never had carrot soup before,but it was something I was planning to make. Yours sounds so flavorful and comforting! Love its yogurt and dukkah topping! Lisa, I know what you mean about recipeworm or whatever we should call that condition. I'm the same way. Your soup looks like just the kind of thing I'd like for lunch today. Veggie and flavor-packed and belly warming. My friend introduced me to Dukkah last fall and I love the stuff! Looks like a great topping for a simple veggie soup. Yum! What a beautiful soup and flavorful toppings. This is the first I've heard of Dukkah. How I wish I hadn't seen this right before dinner, when I'm too tired to go out and get the ingredients. Two days till spring starts and we woke up to snow and sleet. Ugh. Guess there's still time for your beautiful carrot soup...which would be amazing with a grilled cheese sandwich! Your soup looks beautiful Lisa! I've never heard of Dukkah before. Sounds interesting. 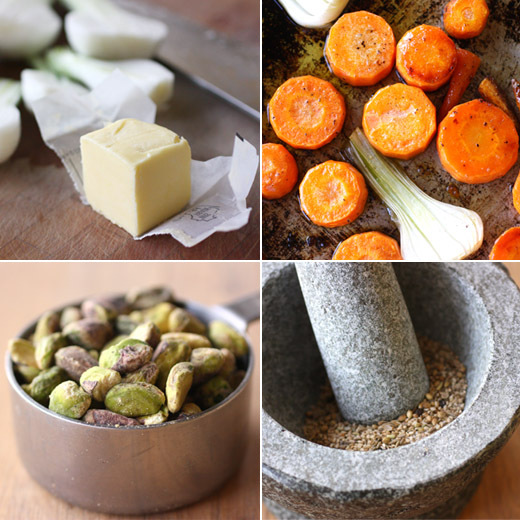 I was going to try making Dukkah spice in the coming weeks too using hazelnuts and almonds! :) Excited to know what it taste like. I have the same reactions to come recipes. Sometimes I just can't get them out of my head until I go ahead and make them! I'm the same way with recipes! And with songs, unfortunately. I remember this from that issue of BA and definitely intended to make it. I think there will be some grilled cheese on the menu and this soup to go with it soon! The dukkah looks wonderful. I can almost smell the spices toasting. What a healthy soup!